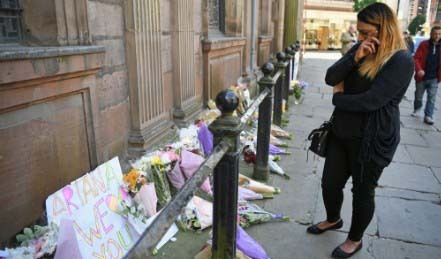 Many of us have recently heard about the tragic set of events that occurred last night in Manchester, England. According to various news reports, a suicide bomber killed himself as well as twenty-two additional people who were attending a music concert. Reporters have also stated that people under the age of eighteen years old where among those killed. Many more people were injured, and the Islamic State of Iraq and Syria or ISIS has claimed responsibility. Fear, anger and shock are among the emotions that have gripped the people of England, in particular, and people throughout the world, in general. As the parent of three teenagers who often attend music concerts, I can only imagine the horror and loss faced by the parents of the victims of this tragedy. I stand with millions of clergy and lay people around the world who are condemning this act of violence as well as praying for the families of those affect by these events. Crises and tragedies are not new to new to England, America or any country throughout the world. When crises and tragedies have arisen over the years, people have often asked me: Where is God in the midst of this problem? I often spend time listening to people when crises occur, as opposed to telling them what I think in the midst of their problem. When they ask, however, as a follower of the teachings of Jesus Christ, I tell that the God that we serve requires us to care for people (Mark 12:31). Medication may cure; however, people are responsible for showing care. I tell them that the God we serve cares about the building, not the destroying, of community (see John 13:34). People are interdependent, and the success and well-being of one person is often connected to the success and well-being of another. I remind that true hatred is unmanageable. Eventually, it will destroy the person who is hated as well as the one who hates. Lastly, I tell them that there are some voids in our lives (e.g. the loss of a loved one) that can only be filled and healed by God. As a former substance abuse counselor, I watched people who’ve suffered loss attempt to fill emotional “holes” in their lives with alcohol and other drugs. These emotional “holes” were only filled when they turned their lives over to their Higher Power. Jesus Christ died over 2000 years ago; however, Christ is among us because he lives in those who are committed to his teachings. As we continue to pray for the families of Manchester, England, let us continue to hold steadfast to the faith that has sustained generations during times of tragedy and confusion.